Chosen by the Bears in the first round of the 1975 NFL draft, Payton played hurt during his rookie season (and missed the only game of his career) as he accumulated 679 rushing yards. He broke out in ’76, running for 1390 yards on a league-leading 311 carries and scoring 13 touchdowns, and followed that up with a MVP season in 1977 in which he rushed for 1852 yards, including a then-record 275 in a single game. Over the course of the next seven seasons, Payton rushed for over a thousand years in all but strike-shortened 1982 and led the NFC in rushing for five straight years, despite being part of a lackluster offense that had opposing teams keying on him. 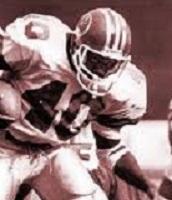 In 1984 he surpassed Jim Brown’s NFL career record of 12,312 rushing yards. Payton was named to the Pro Bowl seven times and was a consensus first-team All-Pro on four occasions prior to ‘85. Bears went 15-1 to finish first in the NFC Central with the conference’s best record while leading the NFL in rushing (2761 yards) and NFC in scoring (456 points). Won NFC Divisional playoff over New York Giants (21-0), NFC Championship over Los Angeles Rams (24-0), and Super Bowl over New England Patriots (46-10). Payton played two more seasons, and was selected to the Pro Bowl once more in 1986. Not only a productive ground gainer, he was an outstanding blocker and receiver out of the backfield, as well as an accomplished passer on option plays (he was even the club’s emergency quarterback). Payton ultimately totaled 10 thousand-yard rushing seasons. He was a consensus first-team All-Pro five times and was chosen to nine Pro Bowls. 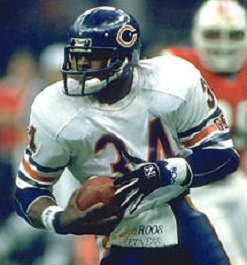 The even-tempered player known as “Sweetness” was also an unselfish team leader and hard worker, and was popular not only with Bears fans, but throughout the league. He retired as the NFL’s all-time leading rusher with 16,726 yards and also topped the list in carries (3838) and rushing TDs (110); his total of 125 touchdowns ranked second. Payton also caught 492 passes for 4538 yards and exceeded 2000 yards from scrimmage in four seasons. The Bears retired his #34 and he was inducted into the Pro Football Hall of Fame, Class of 1993. Richardson was an eighth round draft choice by the Falcons for 1980, one of four linebackers the Falcons took. Starting on the outside, he combined with fellow rookie Buddy Curry, veteran Fulton Kuykendall, and second-year OLB Joel Williams to create an outstanding corps of linebackers. 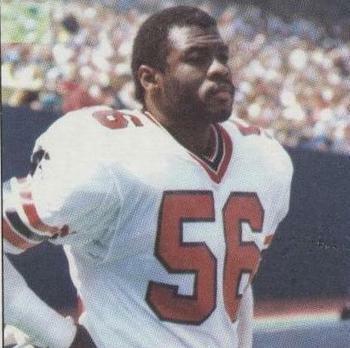 Due to an injury to Joel Williams, Richardson became the team’s chief blitzing linebacker in 1981 and, while his interception total dropped to one, he led the Falcons with 10.5 sacks (unofficially). A fractured shoulder blade limited Richardson to five games in 1983, following the strike-shortened ’82 season, and his level of performance dropped off thereafter. His career lasted just six seasons, through 1985, until he was cut during the preseason in ‘86. Overall, he played in 77 games and intercepted 9 passes; sacks not being an official statistic until 1982, he was credited with 9 but in actuality had more than double that number. 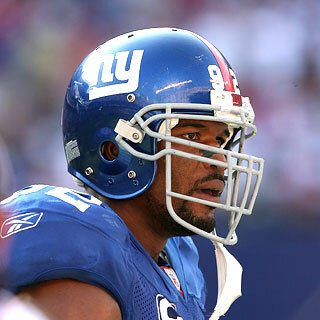 Strahan was chosen by the Giants in the second round of the 1993 NFL draft, but a preseason foot injury hindered his progress as a rookie. He moved into the starting lineup in ’94 and was a consensus first-team All-Pro and Pro Bowl selection for the first time in 1997, a year in which he also reached double digits in sacks with 14. He duplicated the honors in ’98 and went to the Pro Bowl for a third straight year in 1999 despite a drop in sacks from 15 to 5.5. Following a slow start in 2000, Strahan reasserted his dominant pass rushing skills as the season progressed and finished up with 9.5 sacks. Giants went 7-9 to finish third in the NFC East. Strahan was selected to the Pro Bowl in 2002 and again led the NFL with 18.5 sacks in ’03, when he was a consensus All-NFL selection for the fourth (and last) time. While major injuries hampered him in 2004 and ’06, Strahan played until 2007, a total of 15 seasons, and retired following a Super Bowl title for the team. Fast and adaptable, he ended up with 141.5 sacks, which ranked fifth all-time at his retirement, and was selected to the Pro Bowl on seven occasions. The Denver Gold of the United States Football League had gotten off to a 7-1 start during the 1984 season, but were in the midst of a five-game losing streak as they faced the San Antonio Gunslingers on May 25. At 7-6 Denver was still on top of the mediocre Pacific Division, but Head Coach Craig Morton’s club desperately needed a win and was without injured starting QB Craig Penrose. The Gunslingers, in their first season in the USFL, were 5-8 despite coming off a win at Washington the previous week and had their own difficulties. Poorly managed, the Gunslingers, who were coached by Gil Steinke, were respectable on the field and had overcome a 0-4 start. Rookie QB Rick Neuheisel showed considerable promise, but it was the young-but-tough defense that fueled the improvement. There were 20,077 in attendance for the Friday night game at Alamo Stadium. The Gunslingers took a 3-0 lead late in the first quarter on a 32-yard field goal by Nick Mike-Mayer. 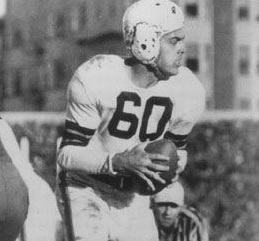 Brian Speelman tied the score less than five minutes into the second quarter with a 23-yard field goal and then backup QB Fred Mortensen (pictured above) threw to RB Bill Johnson for a 23-yard touchdown with 4:20 remaining in the first half. It was 10-3 in favor of the visitors at the intermission. In the third quarter, San Antonio took advantage of a fumble recovery at the Denver 7. RB George Works ran for a TD from two yards out and, with the successful extra point, the game was tied at 10-10. Speelman added another field goal later in the period to make it 13-10 and, before the quarter was over, Denver got a break when the Gunslingers failed to convert a fourth down, allowing the Gold to take over at the San Antonio 29. Four plays later, and now in the final quarter, RB Harry Sydney ran for a three-yard touchdown and Denver was ahead by 20-10. The Gunslingers got within seven points as the 34-year-old veteran Mike-Mayer kicked his ninth straight field goal, from 33 yards out four minutes later. A blocked punt by LB Reggie Oliver then set up another score for San Antonio. Works scored his second touchdown from a yard out and Mike-Mayer booted the tying extra point. But the decisive play of the game came with 1:52 left on the clock as Mortensen tossed a pass to RB Dave Preston that was good for a 32-yard touchdown. It was enough to give the Gold a 27-20 win. Denver outgained the Gunslingers (394 yards to 252) and had more first downs (16 to 10). However, they also turned the ball over twice, to one by San Antonio. In his relief role, Fred Mortensen completed 19 of 27 passes for 308 yards and two touchdowns with none intercepted. WR Elmer Bailey led the Denver receivers with 4 catches for 82 yards while WR Leonard Harris was right behind with three receptions and 81 yards. Harry Sydney rushed for 42 yards on 9 carries. For the Gunslingers, Rick Neuheisel was successful on 11 of 20 throws for 148 yards and no TDs or interceptions. RB Marcus Bonner had 43 rushing yards on 6 attempts and also caught 4 passes for 29 yards. WR Danny Buggs gained the most receiving yards with 50 that all came on a single reception. George Works (pictured at left), who scored two touchdowns, gained 37 yards on 10 carries. Ending the losing streak did not mark a turnaround for Denver. The Gold lost the following week and won just once more the rest of the way, finishing at 9-9 and in third place in the Pacific Division – although, in a week division, they remained in contention until the season finale. San Antonio also finished third in the Central Division with a 7-11 record. 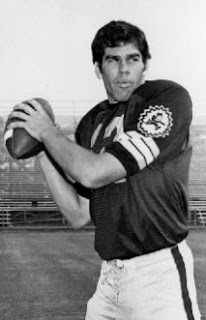 Fred Mortensen appeared in seven games and completed 64 of 100 passes for 994 yards and four touchdowns with two interceptions. Released by the Gold following the season, he was picked up by San Antonio for 1985. 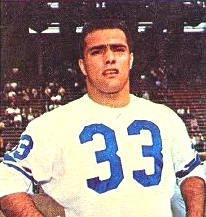 An All-American in college, Pietrosante was taken in the first round of the 1959 NFL draft by the Lions, who were looking to improve their inside running game. While there were questions regarding his speed, he more than met expectations in his rookie year. Lions went 3-8-1 to finish fifth in the NFL Western Conference. Pietrosante rushed for a career-high 872 yards in 1960 and followed up with 841 yards in ’61. He was selected to the Pro Bowl following both seasons. While his numbers dropped off thereafter due to nagging injuries, he played seven years with the Lions and ran the ball 938 times for 3933 yards (4.2 avg. ), making him the franchise’s all-time rushing leader at the time, and 28 touchdowns. He also caught 134 passes for 1323 yards. Pietrosante finished up his career as a backup for two years in Cleveland and ended up in 1967 with 4026 rushing yards. As a quarterback in the NFL, Dameyune Craig appeared in just six games over a period of four seasons after signing with the Carolina Panthers as a free agent out of Auburn. But on May 22, 1999 as a member of the Scottish Claymores of NFL Europe, Craig compiled a passing yardage total that no NFL quarterback to date has approached. Craig had been allocated to the developmental league by the Panthers for the 1999 spring season. The Claymores came into the game at 3-2 following a bad loss against the Rhein Fire in Dusseldorf the previous week. They were facing the Frankfurt Galaxy, who had beaten the Claymores in Edinburgh in overtime a few weeks earlier and were also 3-2. The Scots came right back on a drive highlighted by Craig’s pass to FB Jamie Reader that picked up 52 yards. Craig threw to WR Donald Sellers for 14 yards and capped the series with a five-yard scoring pass to Sellers. The successful extra point made it 7-7. Two plays later, safety Lee Wiggins got the ball back for the Claymores when he intercepted a pass by Barnes at midfield. Completions to RB Jesse Haynes and TE Shon Bell got the Scots deep into Frankfurt territory, but with fourth-and-goal at the one, Craig was unable to score on a quarterback sneak and the Claymores came up empty. The Galaxy made the most of the reprieve in a possession highlighted by missed tackles and ending early in the second quarter with Barnes throwing to McCullough for a 43-yard TD. The Claymores didn’t take long to tie the game up again. Craig threw to WR Yo Murphy who charged down the sideline for a 75-yard touchdown. The Scots put together a seven-play scoring drive that featured long gains by Sellers and WR Kevin Drake and concluded with Craig tossing a 24-yard TD pass to Bell. The tally was 21-14 in favor of the Scottish club at the half. The Claymores extended their lead early in the third quarter, once more in spectacular fashion as Craig threw to Sellers for a 44-yard touchdown. The Galaxy came alive on offense and drove into scoring territory, but DE Jermaine Benoit sacked new Frankfurt QB Jake Delhomme for an 11-yard loss and, on the next play, DB Denorse Mosley intercepted a pass in the corner of the end zone to extinguish the threat. Craig, going for the big strike, immediately hit Sellers for a 71-yard gain, but the Claymores fumbled the ball away on the next play. However, Frankfurt wasn’t able to move offensively and, regaining possession, the Scots started the fourth quarter with a Craig pass to Sellers for 36 yards. Three plays later, Haynes ran for a one-yard TD and, with another successful PAT, the Claymores held a seemingly-comfortable 35-14 lead. Frankfurt wasn’t finished, however, and with 13 minutes left on the clock commenced a comeback. The Galaxy scored on a five-yard touchdown pass from Delhomme to McCullough. Shortly thereafter, Craig fumbled and safety Jamaal Alexander recovered for the home team. Two plays later, Delhomme hit WR Todd Floyd for a seven-yard TD and, with another successful extra point by Ralph Kleimann, the Claymores led by just 35-28. Again the Scots came through with a big play as Craig connected with Sellers for a 39-yard touchdown. It was 42-28 with three minutes remaining, but the Galaxy proved to be resilient. Frankfurt put together a 77-yard drive in eight plays that concluded with Delhomme throwing to Bailey for a six-yard TD. It was once again a one-touchdown game. The Galaxy kept it interesting with a successful onside kick that was recovered by LB Jimmy Clements. With 1:24 still on the clock, Frankfurt had the ball at its own 42 yard line. However, four plays later CB Joey Eloms intercepted a Delhomme pass in the end zone to finally nail down the 42-35 win for the Claymores. Many league records fell in the 77-point contest, including most combined yards (1073). 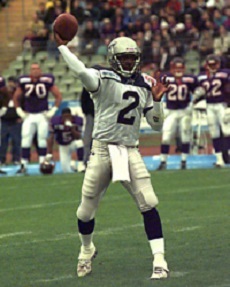 Dameyune Craig completed 27 of 37 passes for 611 yards and five touchdowns – the yardage total was not only a NFL Europe record but surpassed the existing NFL record by 57 yards. Donald Sellers, allocated by the Rams, set a league receiving yardage record with 264 yards on 9 catches that included three touchdowns. Yo Murphy added 8 pass receptions for 149 yards and a TD and Shon Bell had 5 catches for 96 yards. Craig’s jersey was sent off to Canton for display in the Pro Football Hall of Fame. He went on to complete 198 of 339 passes (58.4 %) for 2932 yards and 21 touchdowns with 12 interceptions for a 92.7 passer rating. It proved to be the high water mark of his pro football career – he retired to coaching after a year playing arena football in 2002. Ironically, it was Frankfurt’s Delhomme, allocated to NFL Europe by the Saints in ’99, who went on to a career as the starting quarterback for the Carolina Panthers from 2003 to ‘09. Donald Sellers and Yo Murphy were the top two receivers over the course of the season, just as they had been against Frankfurt. Sellers caught 58 passes for 931 yards (16.1 avg.) and seven touchdowns and Murphy had 45 receptions for 752 yards (16.7 avg.) and four TDs. The big win over the Galaxy ended up being the high point of the season for the Claymores. They lost their remaining games and finished in fifth place at 4-6. Frankfurt recovered to place second in the league at 6-4 and went on to defeat Barcelona for the league title. 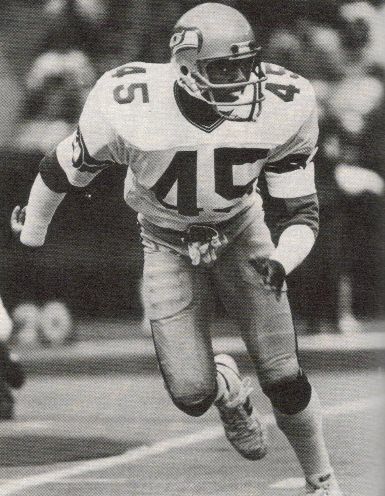 Highly regarded after an outstanding college career, Easley was taken by the Seahawks in the first round (fourth overall) of the 1981 NFL draft. 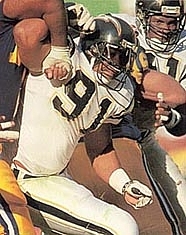 He immediately moved into the starting lineup at strong safety and was selected to the Pro Bowl in 1982 and ’83, when he was also a consensus first-team All-NFL honoree. In his first three years, he intercepted 14 passes as he demonstrated excellent ball-hawking skills to go along with his solid tackling. Seahawks went 12-4 to finish second in the AFC West and qualify for the postseason as a Wild Card entry while leading the NFL in interceptions (38). Won AFC Wild Card playoff over Los Angeles Raiders (13-7). Lost AFC Divisional playoff to Miami Dolphins (31-10). An injury suffered while returning a kick cost Easley three games in 1985, but he was still an outstanding and disruptive performer when healthy and was a consensus first-team All-NFL selection for the third straight year as well as a Pro Bowl honoree for the fourth straight. Continued ankle trouble hindered him further in ’86 and he had surgery. Easley came back to gain a fifth Pro Bowl selection in the strike-interrupted 1987 season but, due largely to acrimony related to his role in the players’ strike, he was traded to the Cardinals in the offseason. He never played for the Cards, however, when a physical revealed a kidney condition that forced his retirement. In seven seasons, Easley intercepted 32 passes and set the standard at his position, but his outstanding career came to a too-early end. The Tampa Bay Bandits of the United States Football League were on a roll, having won five straight games prior to hosting the Oklahoma Outlaws on May 14, 1984. Head Coach Steve Spurrier’s team featured an exciting offense directed by 34-year-old QB John Reaves and a defense that was solid up front if less proficient at defending against the pass. The Oklahoma Outlaws, one of six new clubs for the USFL’s second season, appeared to be going in the opposite direction, having lost three straight games by lopsided scores after getting off to a promising 6-2 start. Coached by Woody Widenhofer, the offense featured QB Doug Williams, who had spent five seasons with the NFL Buccaneers and was making his return to Tampa. Defense was the biggest problem for the Outlaws, who had given up an alarming 124 points in the three losses leading up to the game against the Bandits. There were 45,116 fans in attendance for the Monday night contest at Tampa Stadium, and they lustily booed Williams when he first appeared. The game started off as a shootout as the Bandits scored the first three times they had the ball, driving 77, 78, and 79 yards respectively, and Oklahoma did so on its first two possessions. On the first series, RB Gary Anderson tossed an option pass to TE Marvin Harvey for a 10-yard touchdown to finish it off. The Outlaws came back with a scoring drive of their own, with WR Alphonso Williams catching a pass from Doug Williams for an 11-yard TD. It was 7-7 after a period of play. RB Greg Boone scored a touchdown for the Bandits on the first play of the second quarter, running in from a yard out, and Tampa Bay’s lead increased when John Reaves threw to WR Spencer Jackson for a 26-yard TD. Down by 21-7, the Outlaws rallied back with two quick scores. Williams tossed a 14-yard touchdown pass to WR Lonnie Turner to cap a five-play, 69-yard series. He then threw to TE Jerry Price from three yards away and, with the successful extra point, the game was tied with 2:42 left in the half. 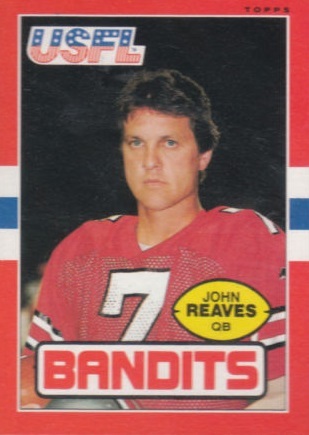 However, the Bandits responded by going 74 yards in seven plays ending with a 10-yard Reaves scoring pass to Harvey. It was 28-21 at the midpoint. After a very competitive first two quarters, Tampa Bay’s defense shut down the Outlaws in the second half. Reaves tossed a pass to WR Eric Truvillion for a 35-yard touchdown in the third quarter and to Anderson for a six-yard TD in the final period. The extra point was missed after the fourth scoring pass by Reaves, but it hardly mattered, and in any event Truvillion, who normally caught passes, threw one to Harvey from 13 yards out for a TD that capped the scoring. It was the third touchdown for Harvey, each coming from a different passer. Tampa Bay ended up winning comfortably by a final score of 48-21. The Bandits rolled up 511 total yards to Oklahoma’s 435 and had the edge in first downs by 28 to 27. However, the Outlaws turned the ball over four times, to none by Tampa Bay. Oklahoma had three possessions end with interceptions, one via a fumble, and one more in which they had to turn the ball over on downs. There was only one punt during the game, by the Bandits in the second quarter. John Reaves had a big day as he completed 22 of 31 passes for 378 yards and four touchdowns with none intercepted. WR Willie Gillespie had 5 catches for 107 yards while Marvin Harvey contributed 5 receptions for 68 yards and the three scores. Eric Truvillion pulled in four passes for 74 yards and a touchdown while also passing for a TD. Gary Anderson rushed for 49 yards on 17 carries and had a touchdown pass as well. For Oklahoma, Doug Williams was successful on 25 of 48 throws for 317 yards and three TDs, but also had three intercepted. In addition, Williams was flagged once for unsportsmanlike conduct after arguing a call and was also penalized for a late hit on an interception return that sparked a scuffle between the teams along the sideline as well as a shower of debris from some nearby fans. Alphonso Williams caught 6 passes for 119 yards and a TD. RB Ted Sample ran for 70 yards on 8 carries. The sixth straight win for the Bandits put them a game behind the Birmingham Stallions in the Southern Division. They went on to finish at 14-4 and earn a Wild Card playoff spot, although they lost convincingly to the Stallions in the first round. Oklahoma’s collapse continued and the Outlaws ended up at 6-12 and fourth in the division. John Reaves, who had been a disappointment in the NFL, ranked fifth among USFL passers as he threw for 4092 yards and 28 touchdowns with a 57.5 completion percentage. Eric Truvillion and Marvin Harvey were favorite targets, each catching 70 passes and scoring 9 touchdowns while accumulating 1044 and 938 yards, respectively. An outstanding all-around talent in college, Moore rushed for 2380 yards, intercepted 10 passes, and averaged 15.8 yards on punt returns and 24.3 yards on kickoff returns. He was taken in the first round of the 1956 NFL draft by the Colts (9th overall). Colts went 5-7 to finish fourth in the NFL Western Conference while placing second in the league in rushing (2202 yards). While he never carried the ball more than 98 times in any of his first six years, he was highly effective when he did, leading the NFL in yards per carry three more times. He was perhaps even more effective as a pass receiver, often lining up out wide as a flanker, and was a formidable offensive weapon for the Colts, leading the league in yards from scrimmage in 1957 (1175) and twice gaining over 900 receiving yards in a season as he achieved consensus first-team All-Pro honors in four consecutive years (1958-61) and five straight Pro Bowl selections (1958-62). He also had over a thousand yards from scrimmage in five consecutive years (1957-61) with a high of 1536 in Baltimore’s first championship season of 1958. In the meantime Moore, nicknamed “Spats” for the manner in which he taped up his football shoes, was shifted full-time to halfback in 1961. In ’62, injuries limited his effectiveness and in 1963 he played in only seven games and saw limited action. 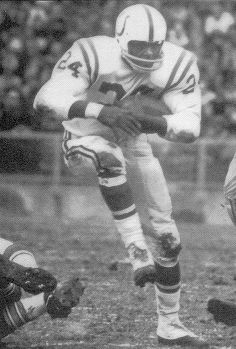 It appeared that his days with the Colts were numbered, but Moore wasn’t traded during the offseason and started 1964 as backup to Tom Matte at halfback. He had a remarkable comeback season, gaining 1056 yards from scrimmage and setting a then-NFL record with 20 touchdowns. Moore gained 878 yards from scrimmage in 1965 (464 rushing, 414 receiving) and played another two years, although he carried the ball just 105 times (for 431 yards) and caught 34 passes as his playing time diminished. Following his retirement after the 1967 season, he had gained 5174 yards rushing on 1069 carries (4.8 avg.) and caught 363 passes for 6039 more yards (16.6 avg.) while accumulating a total of 113 TDs, which ranked second all-time. He totaled 12,449 all-purpose yards. The Colts retired his #24 and Moore was inducted into the Pro Football Hall of Fame, Class of 1975. Drafted by the 49ers in the first round in 1985, Rice moved into the starting lineup as a rookie and showed flashes of future greatness as he caught 49 passes for 927 yards and diverted coverage from veteran WR Dwight Clark. In ’86, Rice broke out with 86 receptions and led the NFL in receiving yards (1570) and TD catches (15). He was a consensus first-team All-Pro selection and was chosen for the Pro Bowl. It was the first of four straight seasons prior to ’90 in which he received those honors, and in the strike-interrupted 1987 season Rice had a record 22 touchdown receptions in just 12 games and received MVP recognition as well. In 1989, he led the NFL in pass receiving yards (1483) and TD catches (17). 49ers went 14-2 to finish first in the NFC West with the best record in the conference while leading the NFC in total offense (5895 yards) and passing yards (4177). Won NFC Divisional playoff over Washington Redskins (28-10). Lost NFC Championship to New York Giants (15-13). Rice went on to play 20 seasons in the NFL and re-wrote the record book by the time he was done. The 1986 and ’87 seasons were the first of 11 straight thousand-yard receiving seasons and 14 overall. He led the league in that category five more times, including a record 1848 in 1995. Rice also had four 100-catch seasons and was the NFL leader twice. A prolific scorer, he had a total of nine years in which he reached double figures in receiving TDs and paced the league six times. After 16 years with San Francisco, Rice moved on to the Raiders for three full seasons plus part of his last year, in 2004, in which he finished up with Seattle. Overall, he retired as career leader in pass receptions (1549), receiving yards (22,895), receiving touchdowns (197), and total TDs (208). He gained the most total yards (23,546) of any player in NFL history. 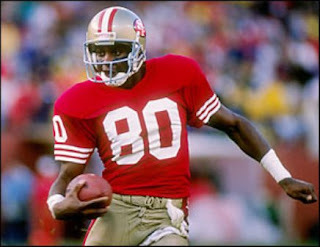 The 49ers retired Rice’s #80 and he was inducted into the Pro Football Hall of Fame, Class of 2010.